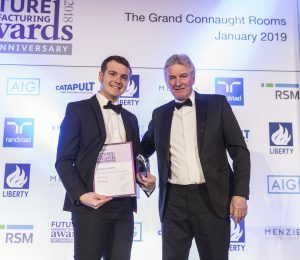 A talented young apprentice from linear motion expert HepcoMotion has won a prestigious national apprentice award at this year’s EEF Future Manufacturing Awards. Tobias Cowan, aged 21, came up trumps by taking gold in the Engineering Manufacturing Apprentice Award, held in London last week. Stephen Phipson, CEO at EEF, the manufacturers’ organisation says: “Tobias is clearly an incredibly gifted individual and I must congratulate him. The judging panel were extremely impressed with the calibre of nominations this year and Toby is at the top of that pile. The future of this industry rests with the next generation and Tobias is a clear role model. Although he’s at the start of his career, I’m sure Tobias would agree that manufacturing’s a challenging yet rewarding sector to be in”. HepcoMotion is committed to the development of young, enthusiastic engineers who have the desire to progress up the career ladder. Offering a well-renowned apprenticeship scheme, Hepco has a strong history working with apprentices as many of the managers and even the chairman himself, started work at HepcoMotion as apprentices.